Ocala, Florida — On October 6, 2013 the Marion County Sheriff’s Office was contacted by Bloomington, Indiana Police. Deputy Zackary Hughes was the point of contact. 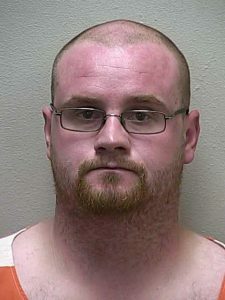 Bloomington, Indiana Police Officers called in reference to a threat that had been posted on Facebook by Michael Scott Rogers, 27, of Ocala. The threat post by Rogers was directed towards his father. The father told authorities he was informed about the post by another family member, and that he was able to read it. The father says he has a history with his son and felt the threat by his son could have been carried out although he (the father) lives in Indiana and his son lives in Ocala. Deputy Zackary Hughes located Rogers at 12188 NW 7th Place. Rogers admitted to writing the post on Facebook via his phone. Rogers told Deputy Hughes he was not trying to make contact with his father, but he was trying to vent and let his other family members know how he felt. Rogers is a convicted felon and cannot posses a firearm. Rogers told Deputy Hughes he didn’t have the money to purchase the weapon or ammunition mentioned in the Facebook post. Rogers also stated that he has not spoken to his father for over a year. Michael Scott Rogers was arrested and charged with Written Threats to Kill or do Bodily Harm. Rogers was also evaluated for a Baker Act.